The Campus Playboys actually made a second overseas tour in the summer of 1935. However, even though there are indications that he considered making that second trip, Richard Sucher did not accompany the group. He had graduated from the Teachers College a year and a half earlier and had already held a regular teaching job during the 1934-1935 school year. Perhaps he thought that he had moved a bit beyond a college band summer tour. It is also possible that he did not believe that he had the time to take another summer off. Perhaps his family needed him at home. Or perhaps he simply could not afford it. 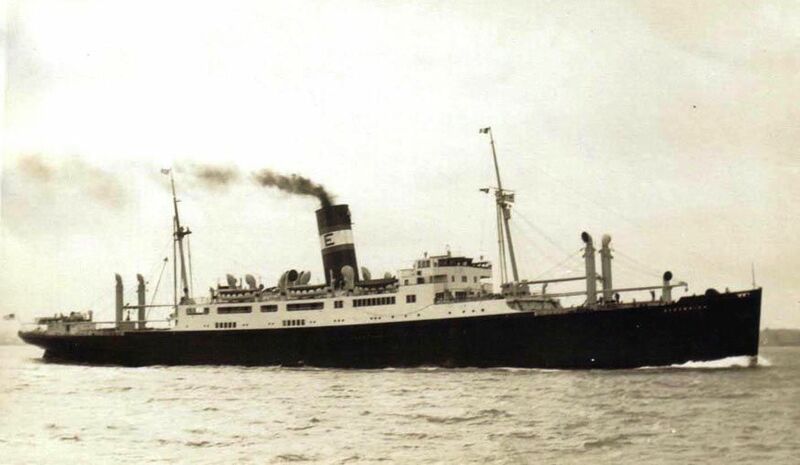 In any case, 1934 trip veterans Bob Getchell, Elliott Hutton, and Quentin Kongsback made arrangements with a shipping line for a six week cruise of the Mediterranean Sea on the Excambion during the summer of 1935. They recruited fellow student and saxophonist Meredith Griffing (Class of 1936) to join them. He replaced Larry Gordon. William Murray, who was not a Teachers College student, replaced Richard Sucher as their drummer and percussion man. Their duties would include playing for dances and concerts almost every day. Unfortunately, we do not have a detailed account of this second trip. But Bob Getchell did talk with student newspaper reporters several times to give at least an outline of their activities. The 1935 group left Cedar Falls on June 3. On the way to New York, their car leaked exhaust fumes that almost proved fatal to some of the band members. Emergency medical treatment in Ohio helped everyone to recover. They sailed from New York City on June 11 and arrived in Naples, Italy, on June 24. They took a motor trip to Pompeii and explored the ruins there. After returning to the ship, they sailed to Alexandria, Egypt, where the clothing, language, and buildings made it clear to them that they had indeed left the Euro-American world behind. They then drove to Cairo and visited the Great Pyramid, the Sphinx, and the tomb of Tutankhamun. They even rode camels. The Excambion then sailed for Jaifa, Palestine, where another motor trip took them to Jerusalem and Bethlehem. The next stop was Beirut. After that, the ship turned back west toward Gibraltar and stopped again at the earlier ports of call. The boys enjoyed several stops in Italy, including visits to the Leaning Tower of Pisa, the Italian Riviera, and the birthplace of Christopher Columbus. They found Malaga, Spain, with its wide boulevards shaded by palms, to be the most beautiful sight of the trip. They also enjoyed the sight of beautiful Spanish women there. After passing through Gibraltar on the way back home, the ship ran into heavy fog and rolling seas. Those conditions sent just about everyone below deck with seasickness. They encountered fog again as they approached New York City. They were all glad to see the Statue of Liberty again. I don't know. Personally I've had enough of knocking around the old world to last me quite awhile. Robert Ward Getchell, Jr., was born in Cedar Falls, Iowa, on June 11, 1916. He was the son of Robert Ward Getchell, Sr., who served on the chemistry faculty of the Iowa State Teachers College from 1909 through 1949. Bob Getchell, Jr., enrolled at the Teachers College for the 1932-1933 school year. He played trumpet with the Richard Sucher's Campus Playboys both locally and on their trip to Europe. Bob Getchell displayed special talents in music, drama, and tennis during his years as a student. He played in the Brass Choir, the College Band, the Marching Band, and the Symphony Orchestra. After graduating from the Teachers College in 1937, he studied at the Eastman School of Music and later earned his Ph.D. in music from the University of Iowa in 1957. Dr. Getchell then taught music at Luther College in Decorah, Iowa. He served in the military during World War II. He married Helen F. Byers. He died in Corpus Christi South in 2002. Bob Getchell was one of the Campus Playboys, who, without Richard Sucher, made another European cruise in the summer of 1935. Lawrence David Gordon was born on April 2, 1916, a son of Gerald David and Edith Hanson Gordon. He was from Marion, Iowa. He was enrolled in the Teachers College from 1933 through 1935. He played in the College Concert Band and the Marching Band and was a member of Phi Mu Alpha Sinfonia. He then pursued a career in music. The student newspaper reported in 1950 that Larry Gordon was a composer and arranger for the RKO Motion Picture Company. He also worked as a conductor for recordings and television. He died in Studio City, Californa, on September 17, 1992. Larry Gordon did not make the 1935 trip. Elliott C. Hutton was born in 1913, the son of George and Tillie Hutton. He was enrolled in the Teachers College for the 1932-1933 school year. He performed on the trombone with the College Concert Band, the Marching Band, and the Symphony Orchestra. But he was also an excellent athlete: he played tennis, baseball, and was an exceptionally good basketball player. He graduated from the Teachers College in 1937. He died on July 28, 1983. Elliott Hutton was one of the Campus Playboys, who, without Richard Sucher, made another European cruise in the summer of 1935. J. (probably Jacob) Quentin Kongsback was born on March 10, 1906, in Humboldt County, Iowa, the son of Jacob C. and Alma E. Kongsback. He was a few years older than his bandmates, who gave him the nickname Squint. He enrolled for the 1933-1934 school year and probably earlier. He performed in the Marching Band, the College Concert Band, and the Troubadours. He also played the piano. He graduated from the Teachers College in 1936. He traveled back to Europe several times before his death on May 17, 1977, in Orange County, California. Quentin Kongsback was one of the Campus Playboys, who, without Richard Sucher, made another European cruise in the summer of 1935. Meredith R. Griffing was born on December 16, 1914, in Cowgill, Missouri, the son of Roy Milo and Herma Jennie Meredith. He enrolled in the Teachers College in the 1931-1932 school year. He did not make the 1934 Campus Playboys trip, but he did go on the 1935 tour. In college he was very active in dramatic productions. He also performed with the College Band, the Marching Band, the Symphony Orchestra, and the Minnesingers. After graduating in 1936, he taught band, orchestra, and speech at Parkersburg, Iowa, and continued to teach there for some years thereafter. He saw military service toward the end of World War II. He died on March 3, 2004. Text by University Archivist Gerald L. Peterson; scanning by Library Assistant Joy Lynn, December 2014; last updated, February 13, 2015 (GP).